Organised by the United Nations GI Working Group and hosted by the European Space Agency in Frascati, Italy the 1st UN SDI Global Partners Meeting will be held on 1-2 March 2007. HUCO's Steering Committee (www.unsdi.hu) will be represented by Pál Lévai of FÖMI, the Institute of Geodesy, Cartography and Remote Sensing (www.fomi.hu). 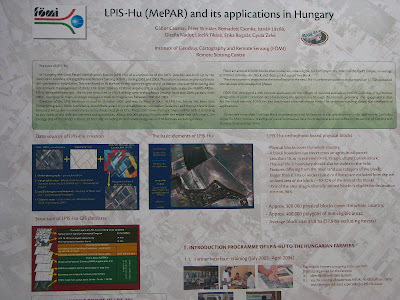 The HUCO presentation will be held by the head of HUCO based on recent contributions provided by stakeholders Hungarian Meteorological Service (www.met.hu), Ministry of Environment and Water (www.kvvm.hu), Ministry of Defense Mapping Company (www.topomap.hu) and FÖMI. UN SDI HUCO stakeholder VÁTI ( www.vati.hu) produced a poster dedicated to the event and flyers will be distributed for the participants introducing the Hungarian hot issues as reflected by the leading GIS journal Térinformatika and the national GI association called HUNAGI (www.hunagi.hu). Head of Department of Agriculture Dr. É. Laczka at the National Statistical Office (member of HUNAGI) and Dr. G. Remetey-Fülöpp, Secretary General of HUNAGI. The award winners present delivered short presentations at the MAGISZ Annual Assembly today in freely selected topics including "Milestones in the history of agroinformatics" and "Spatial Data Infrastructure - challenge and potentials". 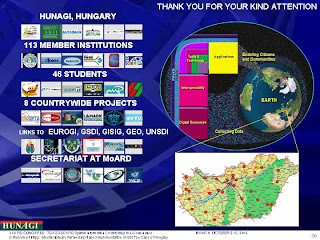 The SDI community of HUNAGI was well represented by the Hungarian Society of Surveying, Mapping and Remote Sensing (MFTTT), the Institute of Geodesy, Cartography and Remote Sensing (FÖMI), the Research Institute of Agroeconomics (AKI), Budapest Corvinus University Chair of Agroinformatics represented by Academician Harnos, and the Debrecen University. GSDI Interim Executive Director Prof Dr. Harlan Onsrud nominated the Association's Secretary (from HUNAGI) as updated principal designator to GEO Secretariat. The roadmap of the actions contains the preparation of a Ministerial-level Meeting at the GEO Secretariat hosted by the WMO in Geneva in November. 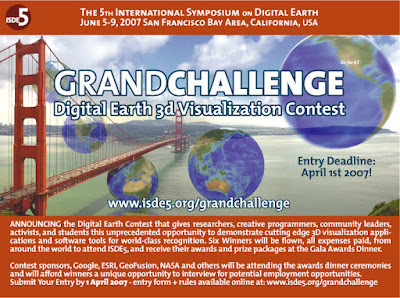 It is anticipated "prizes of this nature will encourage technological advancements for the good of mankind"
An unprecedented International Digital Earth 3D Visualization contest has been launched, under sponsorship of Google, NASA, ESRI, and other technology leaders. This international contest will seek to discover the best examples of visualizing the challenging issues involved in bridging science to public understanding, policy, and action. We would sincerely appreciate if you would share the attached poster and information above to your colleagues and students. Six winners will be flown to UC Berkeley for the 5th International Symposium on Digital Earth where they will experience a life-changing opportunity to debut their work and be recognized as the bright stars of our future. Thank you for your support of this time-sensitive Grand Challenge. 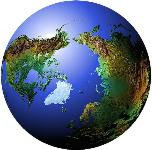 Director-General, 5th International Symposium on Digital Earth"
Approved by the European Parliament on 12th February, the INSPIRE Directive will come into force 20 days following its publication on the Official Journal of the European Union. The Directive will come into force 20 days following its publication on the Official Journal of the European Union. Experiences and statistics on the previous FPs were summarized by top representatives of the Hungarian Academy of Sciences Secretary General Prof. Atilla Meskó, the Budapest University of Technology and Economics Dr.Miklós Zrinyi, while the FP7 was introduced by Zoran Stancic, Deputy DG at DG Research, academician József Gyulai , and Dr. Ilona Vass, Deputy President of the National Agency for Research and Technology. The FP7 components People, Cooperation, Ideas and Capacities were highlighted by representatives of the European Commission. Practical information on rules for participation and on CORDIS, the gateway for participation were also introduced. Presentation slide illustrating the wide variety of members of HUNAGI. The database Central Europe Digital presents to you relevant intermediary organisations in the area of information and communication technologies in Central Europe. 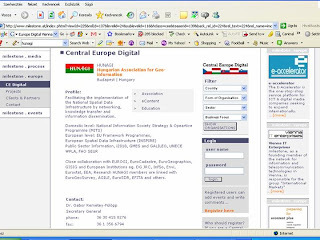 The Hungarian GI association HUNAGI was invited by Manager Hans-Peter Ritt and registered on 30th January 2007. If you are looking for contacts and partners in Central Europe, you will find the appropriate contact to associations, clusters, networks and other multipliers here. As a registered user you will have an enhanced access to the database and it's features. 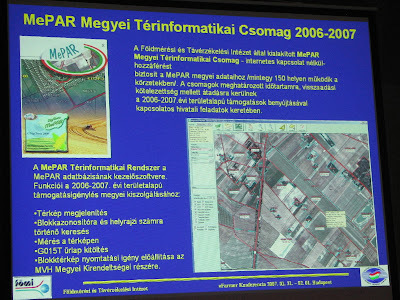 About one million annotated colour orthophoto prints have been produced by FÖMI RSC in 2006 in order to facilitate the applications of the farmers. The number of applicants in 2006 were more than 200,000. GPS, Remote Sensing and mobile office tools are used at the site controls, which are needed only in few percents of the applications. County-tailored GIS-kits on CDs with full MePAR capability were distributed for use at 150 district level offices. Both the prime contractor and subcontractor are valued members of HUNAGI. László G. Papócsi, Head of the Information Management at Szent István University's GAK Public benefit company overviews the extension services related to the electronic applications for the area based subsidies. 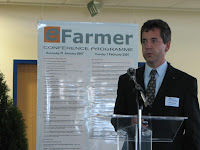 In 2006 nearly 50% of the invited 112 organisations took part in the pilot financed by eContent. 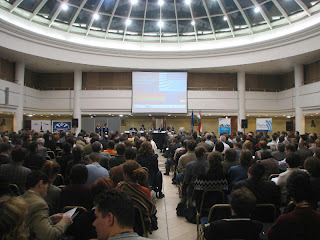 In 2007 the number of the organisations to be invited will be about 4000. 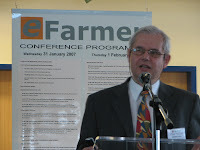 More details: www.gak.hu and www.efarmer.net .